The Aggregat series was a set of ballistic missile designs developed in 1933–45 by a research program of Nazi Germany's army (Wehrmacht). Its greatest success was the A4, more commonly known as the V-2. The German word Aggregat refers to a group of parts or components of machinery, an assemblage working together. The A1 was the first rocket design in the Aggregat series. It was designed in 1933 by Wernher von Braun in a Wehrmacht (German armed forces) research program at Kummersdorf headed by Walter Dornberger. The A1 was the grandfather of most modern rockets. The rocket was 1.4 metres (4 ft 7 in) long, 30.5 centimetres (12 in) in diameter, and had a takeoff weight of 150 kilograms (331 lb). The engine, designed by Arthur Rudolph, used a pressure-fed rocket propellant system burning alcohol and liquid oxygen, and produced 300 kgf (660 lbf, 2.9 kN) of thrust for 16 seconds. The rocket was stabilized by a 40 kg (88 lb) gyroscope in the nose, but there was concern that this might cause problems with the liquid fuels. Although the engine had been successfully test fired, the first flight attempt blew up on the launching pad on 21 December 1933. Since the design was thought to be unstable, no further attempts were made, and efforts moved to the A2 design. The A2 was designed in 1934 by von Braun under the program at Kummersdorf headed by Walter Dornberger. At a length of 1.6 metres (5 ft 3 in) and thrust of 3 kN from alcohol and liquid oxygen, it was in outline similar to the A1. However, in contrast to the A1, the A2 had the stabilization gyroscopes in the center of the rocket between the alcohol and oxygen tanks, which made it more stable. The rocket weighed 72 kilograms (159 lb) empty, with takeoff weight of 107 kilograms (236 lb). Initial flight testing was done in September 1934 at Kummersdorf. Two A2s were built for a full out test, and were named after a Wilhelm Busch cartoon, Max and Moritz. On December 19 and December 20, 1934 they were launched in front of the Army brass on Borkum island in the North Sea. They reached altitudes of 2.2 kilometres (1.4 mi) and 3.5 kilometres (2.2 mi). Development of the A3 can be traced at least to February 1935 when Major Ernst Ritter von Horstig sent General Karl Becker a budget of almost half a million marks for the construction of two new test stands at Kummersdorf. Included were mobile test rigs, small locomotives, and office and storage space. The A3 plans called for a rocket with an inertial guidance system and a 1,500 kg (3,300 lb) thrust engine. In March 1936, Army General Werner von Fritsch witnessed a static firing of an A3 engine at Kummersdorf, and was sufficiently impressed to lend his support to the rocket program. Like the earlier A1 and A2 rockets, the A3 also used a pressure-fed propellant system, and the same liquid oxygen and 75% alcohol mixture as the earlier designs. It generated its 14.7 kN (3,300 lbf) for 45 seconds. It used a three-gyroscope system to deflect tungsten alloy jet vanes. The design was finished and secretly patented in the spring of 1936 and further modifications that made the rocket stable at supersonic velocities were finalized in the autumn. This was the first of the Aggregat rockets to be launched from the Peenemünde area. As part of Operation Lighthouse the first A3 was launched on 4 December 1937, but suffered problems with both premature parachute deployment and engine failure, and crashed close to the takeoff point. The second launch on 6 December 1937 suffered similar problems. The parachute was disabled in the third and fourth rockets launched on 8 and 11 December 1937, but these, too, experienced engine failures, though the lack of parachute drag allowed them to crash further from the launch site. According to another source, one A3 reached a maximum downrange of 12 km (7.5 mi) and maximum altitude of 18 km (11 mi). With each launch a failure, von Braun and Dornberger looked for the cause. At first there was some thought of an electrostatic charge that prematurely set off the parachute, but this was largely disproved. Ultimately, the failures were attributed to the inadequate design of the rocket's experimental inertial guidance system and minor instabilities in the body and fin design. After this unsuccessful series of launches, the A3 was abandoned and redesigned as the A5. In the meantime, work on the A4 continued. The A5 was a scaled-down test model of the A4 which replaced the former unsuccessful A3 in this role. It was flown from 1938 to 1942, and played a vital role in testing the aerodynamics and technology of the A4. Its rocket engine was identical to the A3, with a new control system and a shape similar to the A4. 25 were launched, some several times; it was fitted with a parachute recovery system and could float for up to two hours before sinking to allow recovery by boat. Variants were constructed both with no propulsion system and monopropellant engines for air drop testing. The A5 was 5.825 m (19.11 ft) long, with a diameter of 0.78 m (2 ft 7 in) and a takeoff weight of 900 kg (2,000 lb), and like the A3 was fueled with alcohol with liquid oxygen as an oxidant. The first launch of the A5 took place in the summer of 1938 at Greifswalder Oie and the first successful guided flights were made in October 1939 in order to test the control systems planned for use in the A4. The A5 reached a ceiling of up to 12 km (7.5 mi). The A4 was a full-sized design with a range of about 322 kilometers (200 mi), an initial top altitude of 89 kilometers (55 mi) and a payload of about a tonne. Versions of the A4 were used in warfare. They included the first ballistic missile and the first projectile to reach outer space. This increase in capability came from a redesign of the A3 engine, now known as the A5, by Walter Thiel. It became clearer that von Braun's designs were turning into useful weapons, and Dornberger moved the team from the artillery testing grounds at Kummersdorf (near Berlin) to a small town, Peenemünde, on the island of Usedom on Germany's Baltic coast, in order to provide more room for testing and greater secrecy. This version was reliable, and by 1941 the team had fired about 70 A5 rockets. The first A4 flew in March 1942, flying about 1.6 kilometers (1 mi) and crashing into the water. The second launch reached an altitude of 11 kilometers (7 mi) before exploding. The third rocket, launched on October 3, 1942, followed its trajectory perfectly. It landed 193 kilometers (120 mi) away, and reached a height of 83 kilometers (52 mi). The highest altitude reached during the war was 174.6 kilometres (108.5 miles) on 20 June 1944. Production started in 1943 on the rocket. The missile testing ground at Blizna was quickly located by the Polish resistance movement, the Armia Krajowa, thanks to reports from local farmers. Armia Krajowa field agents even managed to obtain pieces of the fired rockets, by arriving on the scene before German patrols. In early March 1944, British Intelligence Headquarters received a report of an Armia Krajowa agent (code name: ‘Makary’) who had covertly surveyed the Blizna railway line and observed a freight car heavily guarded by SS troops containing ‘an object which, though covered by a tarpaulin, bore every resemblance to a monstrous torpedo’. Subsequently, a plan was formed to make an attempt to capture a whole unexploded V-2 rocket and transport it to Britain. Around 20 May 1944, a relatively undamaged V-2 rocket fell on the swampy bank of the Bug River near the village of Sarnaki and local Poles managed to hide it before German arrival. The rocket was then dismantled and smuggled across Poland. In late July 1944, the Polish resistance (Home Army and V1 and V2) secretly transported parts of the rocket out of Poland in Operation Most III (Bridge III), for analysis by British intelligence. In late 1943 Deutsche Arbeitsfront Director, Otto Lafferenz, proposed the idea of a towable watertight container which could hold an A4 rocket. This suggestion progressed to the design of a container of 500 tons displacement to be towed behind a U-boat. Once in firing position, the containers would be trimmed to bring them vertical for launch. The project was dubbed Projekt Schwimmweste and the containers themselves referred to by the codename Prüfstand XII. Work on the containers was carried out by the Vulkanwerft, and a single example was completed by the end of the war, but never tested with a rocket launch. In anticipation of the possibility that launch sites might be forced back into the Reich itself, von Braun and his colleagues were put under pressure to develop a longer-range version of the A4 known alternately as A9 and A4b, the reason for the dual designation being that the A4 series had received "national priority"; the A4b designation ensured the availability of scarce resources. In June 1939, Kurt Patt of the Peenemünde Design Office, proposed wings for converting rocket speed and altitude into aerodynamic lift and range. As the rocket encountered thicker atmosphere on its descent phase, it would execute a pullout and enter a shallow glide, trading speed for distance. Patt also proposed the Flossengeschoss (fin projectile). Both concepts were utilized by Walter Dornberger when he drafted a memo for presentation to Hitler regarding the "America rocket" on July 31, 1940. Design studies on the A9 began in 1940. In addition to its wings, the A9 would have been somewhat larger than the A4 and its engine would have produced about 30% more thrust. Following wind tunnel testing of models, the design was subsequently modified to replace the wings with fuselage strakes, as the tests showed that these provided better lift at supersonic speeds and also solved the problem of transonic shift of the centre of lift. Development was suspended in 1941, but in 1944 several V-2s were modified to an approximation of the A9 configuration under the designation A4b. It was calculated that by fitting wings, the A4's range would be extended to 750 km (470 mi), allowing targets in Britain to be attacked from launch sites within Germany itself. It was intended that following launch the curve of the A4b's trajectory would become shallower and the rocket would glide toward its target. It was anticipated that interception by enemy aircraft at the end of the glide phase would be virtually impossible as over the target the A-4b was intended to enter a near vertical dive leaving little time for interception. The A4b concept was tested by fitting swept back wings to two A4s launched from Blizna. Little development work had been carried out and the first launch on 27 December 1944 was a complete failure. The second launch attempt, on 24 January 1945, was partially successful, in that the wing broke off, but the A4b still managed to become the first winged guided missile to break the sound barrier and attain Mach number 4. A6 was a designation applied to a variant of the A5 test rocket which used different propellants. Some sources indicate that it was also applied to a speculative proposal for a manned aerial reconnaissance version of the A4b winged variant of the A4. This A6 was initially proposed to the German Air Ministry as an uninterceptable reconnaissance craft. It would be launched vertically by rocket, taking it to an apogee of 95 km (59 mi); after re-entering the atmosphere it would enter a supersonic glide phase, when its single ramjet would be ignited. It was hoped that this would provide 15 to 20 minutes of cruise at 2,900 km/h (1,800 mph) and would allow the aircraft to return to its base and make a conventional runway landing assisted by a drag chute. However, the Air Ministry had no requirement for such an aircraft and the proposal was rejected. Similar concepts (though unmanned) were produced after the war in the form of the USA's SM-64 Navaho missile and the USSR's Burya, both intercontinental cruise missiles with ramjet propulsion. The A7 was a winged design that was never fully constructed. It was worked on between 1940 and 1943 at Peenemünde for the Kriegsmarine. The A7 was similar in structure to the A5, but had larger tail unit fins (1.621 m²) in order to obtain greater range in gliding flight. Two unpowered models of the A7 were dropped from airplanes in order to test flight stability; no powered test was ever performed. The finished rocket should have produced a takeoff thrust of 15 kN and a takeoff weight of 1000 kg. The design had a diameter of 0.38 m and a length of 5.91 m.
The A8 was a proposed "stretched" variant of the A4, to use storable rocket propellants (most likely nitric acid & kerosene). The design never reached the prototype stage, but further design work was carried out after the war by a German rocket team in France as the "Super V-2". The project was eventually cancelled, but led to the French Véronique and Diamant rocket projects. It was proposed to use an advanced version of the A9 to attack targets on the US mainland from launch sites in Europe, for which it would need to be launched atop a booster stage, the A10. Design work on the A10 began in 1940, for a projected first flight to take place in 1946. The initial design was carried out by Ludwig Roth und Graupe and was completed on 29 June 1940. Hermann Oberth worked on the design during 1941, and in December 1941 Walter Thiel proposed that the A10 use an engine composed of six bundled A4 engines, which it was thought would give a total thrust of 180 tonnes. Work on the A10 was resumed in late 1944 under the Projekt Amerika codename, and the A10's design was amended to incorporate a cluster of 6 A4 combustion chambers feeding into a single expansion nozzle. This was later altered to a massive single chamber and single nozzle. Test stands were constructed at Peenemunde for firings of the 200 tonne thrust motor. It was considered that existing guidance systems would not be accurate enough over a distance of 5,000 km, and it was decided to make the A9 piloted. The pilot was to be guided on his terminal glide towards the target by radio beacons on U-boats and by automatic weather stations landed in Greenland and Labrador. The final design of the A10 booster was approximately 20 m (66 ft) in height. Powered by a 1,670 kN (380,000 lbf) thrust rocket burning diesel oil and nitric acid, during its 50-second burn it would have propelled its A9 second stage to a speed of about 4,300 km/h (2,700 mph) and an altitude of 400 km (250 mi). 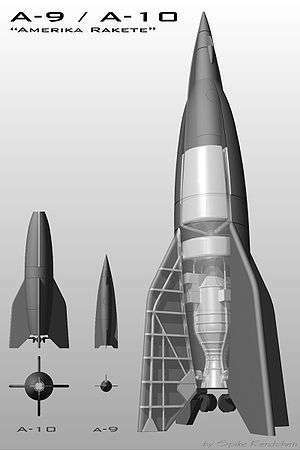 The A11 (Japan Rakete) was a design concept which would have acted as the first stage of a three-stage rocket, the other two stages being the A9 and A10. The A11 design was shown by von Braun to US officers in Garmisch-Partenkirchen; the drawing was later published in 1946 by the US Army. The A11 was shown as using six of the large single-chamber engines proposed for the A10 stage, with a modified A10 second stage nested within the A11. The design also showed the winged A9, indicating a gliding landing or bombing mission. To achieve orbit, either a new "kick stage" would have been required, or the A9 would have to have been lightened. In either case, only a payload of approximately 300 kg (660 lb) could have been placed in a low earth orbit. The A12 design was a true orbital rocket. It was proposed as a four-stage vehicle, comprising A12, A11, A10 and A9 stages. Calculations suggested it could place as much as 10 tonnes payload in low Earth orbit. The A12 stage itself would have weighed around 3,500 tonnes fully fuelled, and would have stood 33 m (108 ft) high. It was to have been propelled by 50 A10 engines, fuelled by liquid oxygen and alcohol. ↑ "Aggregat". Digitales Wörterbuch der deutschen Sprache (in German). Retrieved 22 March 2011. 1 2 Gatland 1989, p. 10. ↑ "Raketenaggregate „A1" und „A2"", Aggregat 2 (in German), DE . ↑ Neufeld, M.J. Von Braun: Dreamer of Space, Engineer of War. New York: Knopf, 2007. p 75. ↑ Huzel 1962, p. 233. ↑ Neufeld 1996, p. 81. ↑ Huzel 1962, p. 236. ↑ Neufeld 1996, pp. 84–85. ↑ Huzel 1962, p. 235. 1 2 Neufeld 1996, pp. 102–5. ↑ Gatland 1989, p. 11. ↑ Neufeld 1996, p. 105. 1 2 3 Michels, Juergen; Przybilski, Olaf (1997). Peenemuende und seine Erben in Ost und West. Bonn: Bernard & Graefe. ↑ Dornberger, Walter (1985), Peenemuende, Berlin: Moewig, ISBN 3-8118-4341-9 . ↑ McGovern, James (1964). Crossbow and Overcast. New York: W. Morrow. p. 42. ↑ Wojewódzki, Michał (1984). Akcja V-1, V-2 (in Polish). Warsaw. ISBN 83-211-0521-1. ↑ Paterson, Lawrence (2009). Black Flag: The Surrender of Germany's U-Boat Forces. MBI. pp. 57–58. ISBN 978-0-7603-3754-7. ↑ Neufeld 1996, pp. 63, 93, 250, 283. ↑ Neufeld 1996, p. 92. ↑ Neufeld 1996, pp. 138, 283. ↑ Reuter 2000, pp. 90–91. ↑ Reuter 2000, p. 87. ↑ Harvey, Brian (2003). Europe's space programme: to Ariane and beyond. Springer. p. 16. ISBN 978-1-85233-722-3. ↑ Reuter 2000, p. 179. ↑ Huzel 1981, p. 237. ↑ Reuter 2000, pp. 91–93. ↑ Reuter 2000, p. 94. ↑ Reuter 2000, p. 95. V2 EMW A4b die bemannte Rakete (in German), DE: Khiechhorn . "Neubau", Aggregat 2 (in German), DE . "Aggregat 1", Aggregat 2, DE . Technical discussion of the A1] (in German), by the same author as the above A2 site. The author has examined primary sources; based on them, he claims that widely repeated data about the A1 is mostly in error. Original drawings from the development of A4/V2 and others (in German), DE: Digipeer, 20,000 . The A4 Rocket Part 1 (in German), DE: Bernd Leitenberger . The A4 Rocket Part 2 (in German), DE: Bernd Leitenberger . "Part Two", V2 (article), Aerospace museum, Oct 2004 . Space (lecture) (4), University of Oregon . "Reconstruction, restoration & refurbishment of a V-2 rocket", Nasa tech (spherical panoramas of the process and milestones) . Some families include both missiles and carrier rockets; they are listed in both groups.